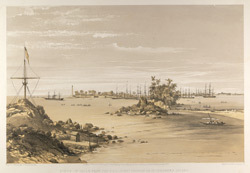 Lithograph by Jonathan Needham (fl.1850-1874), after Charles D.C. O'Brien, of the Fort at Galle from Closenberg Island, dated 1st January 1864. This print forms plate 15 from 'A series of fifteen Views of Ceylon illustrative of Sir J.E. Tennent's work, from sketches made on the spot by Capt C. O'Brien, late Assistant Surveyor General Ceylon', London 1864. Part of the text which accompanies this image reads, "Galle is now the resort of the Peninsular and Oriental Company's steamers, bi-monthly from England and Calcutta. These are met by their steamers from China, Australia, and Bombay, which, together with numerous ships laden with coal for their use, give the harbour a lively appearance, adding much to its natural beauty." Galle, on the south-western coast of the island, has a natural harbour and is one of the most ancient settlements of Sri Lanka, and was a port from pre-Christian times. It is protected by a promontory called the Rock or Galle Point. Galle was the main port of the island, even though the entrance to its harbour was dangerous because of submerged rocks and reefs. It was supplanted in the 1870s after the construction of breakwaters in the development of Colombo's harbour.